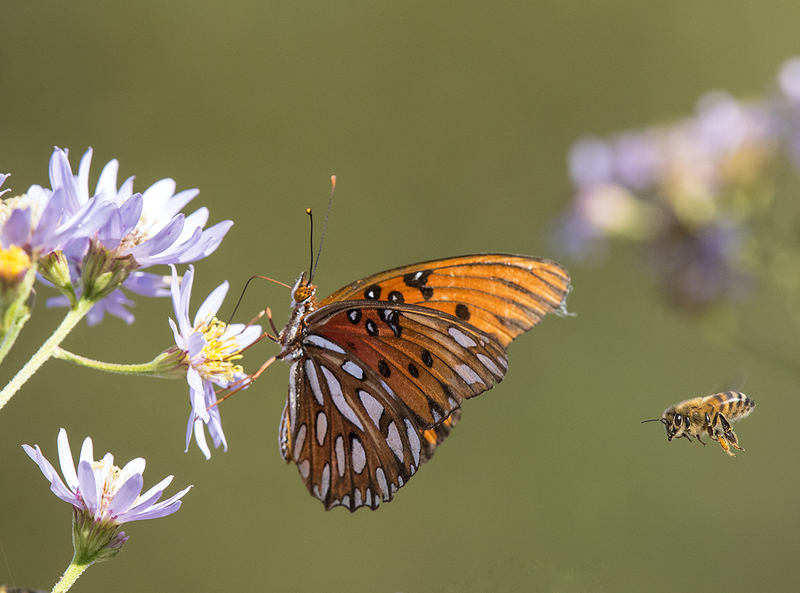 Gulf Fritillary with honeybee on tartarian aster. Photo by Susan Post. Listed as a rare stray in Butterflies of Illinois by Jeffords, Post and Wiker, the Gulf Fritillary is one butterfly species that Michael and I had yet to see in Illinois. During early October we were alerted to the butterfly’s presence in Southern Illinois by two Master Naturalists—Judy Groskind, who sighted it at Crab Orchard Wildlife Refuge, and Karen Frailey, who spotted it in eastern Pope County. Unfortunately, we were out of the country and couldn't seek out the insect immediately. Armed with cameras, we headed out. 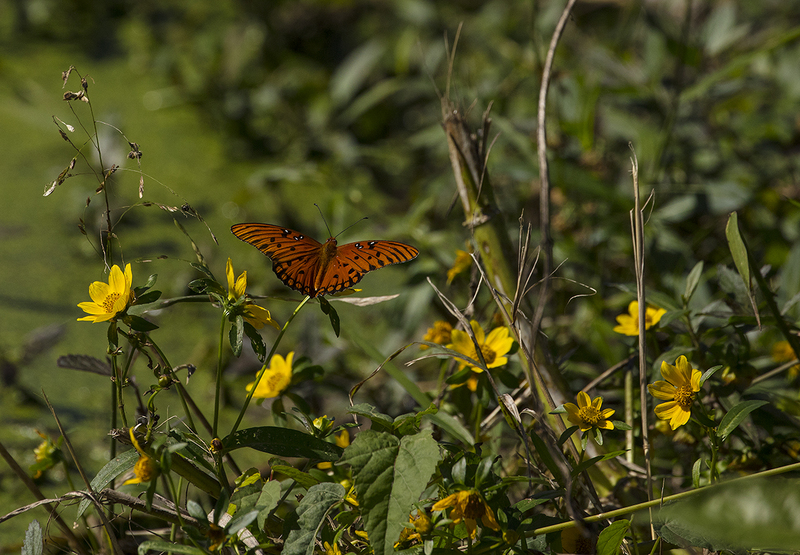 There, nectaring on blooming swamp marigold (Bidens cernua) was a freshly emerged Gulf Fritillary. Gulf Fritillary on swamp marigold. Photo by Michael Jeffords. The prize admired and documented, we continued our hike and soon encountered a second, worn Gulf Fritillary nectaring on Tartarian Aster, part of a late season blooming pollinator garden. This aster was from the original stock planted by legendary Illinois Natural History Survey ornithologist Jean Graber on her farm (now Warbluff Audubon Sanctuary). 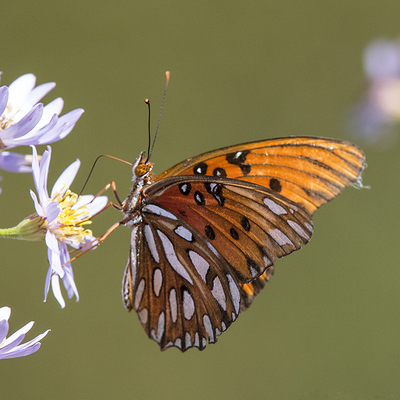 Gulf Fritillary on tartarian aster. Photo by Susan Post. Sighting both a freshly-emerged and a worn individual suggests that we were observing a mini outbreak of this southern butterfly, rather than just isolated strays. 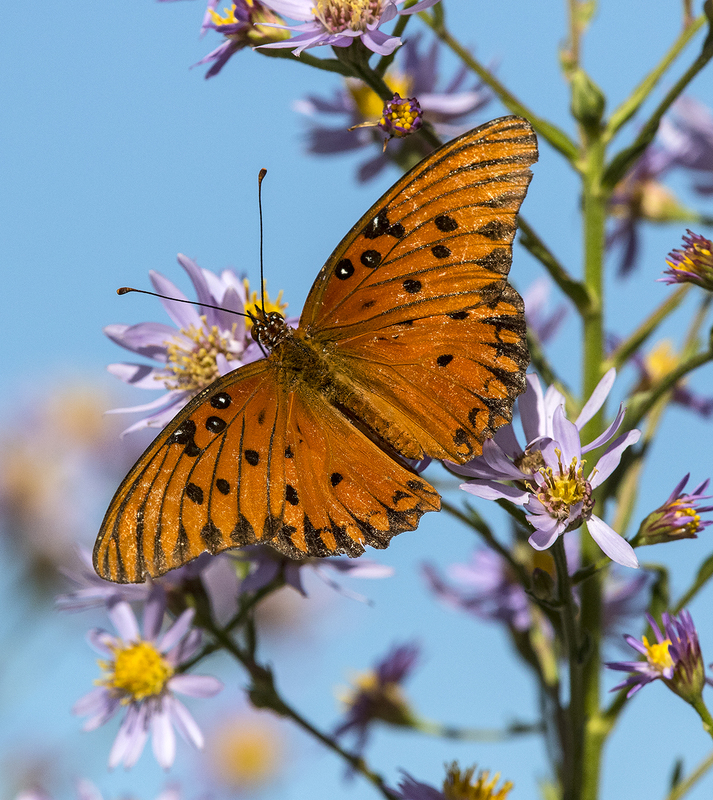 Gulf Fritillaries likely enter Illinois from the gulf coast after hurricanes from the Gulf of Mexico make their way north, often touching Illinois. The Gulf Fritillaries can persist until winter as their food plant, passion vine, is quite common in southern Illinois.